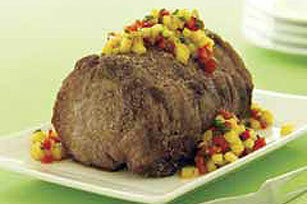 Create a memorable night with our Grilled Pork Loin with Pineapple Salsa. This grilled pork loin is enhanced beautifully by the slightly sweet salsa. Mix pineapple, red pepper, cilantro and dressing until well blended. Cover and refrigerate until ready to serve. Combine coating mix and seasonings in large plastic bag. Brush lime juice evenly onto meat. Place meat in bag with coating mixture; close bag and shake until meat is evenly coated. Remove meat from bag; place in disposable roasting pan, or on large piece of foil that has been poked in several places with holes. Press any remaining coating mixture onto meat. Turn off one of the grill burners, then place meat on that side. Close lid of grill. Cook 1 hour or until meat is cooked through. (Pork is done when meat thermometer inserted into thickest part of meat registers 145°F.) Serve with the pineapple mixture. Don't have a plastic bag large enough to coat the pork roast? No problem. Just cover a large baking sheet with wax paper, then sprinkle with coating mix. Add the meat and roll in coating mix until evenly coated. Preheat oven to 350°F. Coat meat as directed, then place in roasting pan. Bake 1 hour or until meat is cooked through. Cooking the meat in the preheated grill over the side without the burner on uses the indirect heat method. This ensures tender meat without burning the coating. Look for a roast that is not tied with string. The string will pull the SHAKE 'N BAKE Coating off of the meat when it is removed from the cooked meat. Ask your butcher for a 5-lb. boneless center-cut pork loin roast. Prepare as directed, increasing the grilling time to 1-1/2 to 1-3/4 hours. Makes 18 servings.